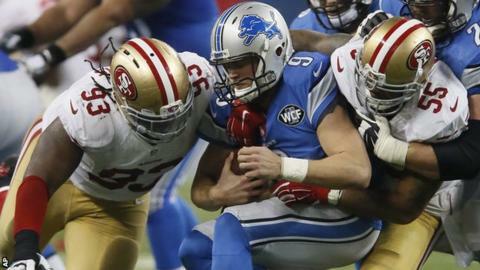 Twitter has agreed a deal to broadcast Thursday night NFL games online across the world for free. Twitter was bidding against a number of companies, including Verizon, Yahoo and Amazon, to win the rights. Facebook dropped out of the bidding last week. "Twitter is where live events unfold and is the right partner for the NFL," said NFL commissioner Roger Goodell. The NFL signed a multi-year partnership with Twitter last year to deliver daily video and other content to fans. Television viewers will still be able to watch live games and highlights packages under existing partnerships with traditional broadcasters. In the UK, the NFL signed a five-year deal with Sky last year, while the BBC has a two-year deal to show international series games in London and the Super Bowl, as well as a weekly highlights show and digital clips. As part of the the NFL's new agreement with Twitter, the social media platform will stream live video of 10 Thursday games to its 800 million users. The deal also includes in-game highlights and pre-game Periscope broadcasts from players and teams. "There is a massive amount of NFL-related conversation happening on Twitter during our games," said Goodell. "People watch NFL games with Twitter today," said Twitter CEO Jack Dorsey. "Now they'll be able to watch right on Twitter Thursday nights." Last season, the NFL carried out a live streaming trial of a regular-season NFL game with Yahoo.